- Right to free trade or right to food? - Markets for the poor? In recent years, developing countries have seen a rapid expansion of intensive livestock production, a trend generally referred to as the “livestock revolution”. It is boosted by the growing demand for animal proteins, based on population growth and an increase of purchasing power, particularly in urban regions of developing countries. This trend towards industrialised, land-detached livestock production systems causes considerable environmental pollution. Therefore, an international research effort aims to study interactions between livestock husbandry and environment, with the ultimate goal of finding sustainable strategies to reduce pollution. Against this backdrop, Harald Menzi, coordinator for applied research and development at the Swiss College of Agriculture, and colleagues from FAO have presented a new study on livestock density and nutrient balances in Asia. 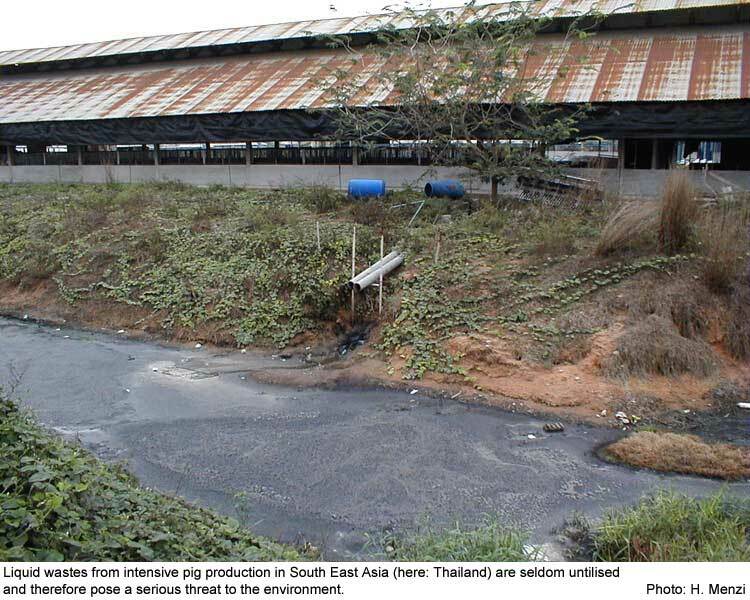 The authors point out various environmental risks caused by intensive livestock production in Asia: pollution and overuse of surface and ground water, accumulation of nutrients and heavy metals in the soil, emission of greenhouse gases, loss of genetic resources, and others. The study shows that in certain regions pollution is particularly heavy: significant nutrient overloads were found in Japan, South Korea, in large areas in eastern China, and generally in regions around large urban centres. However, these overloads are only partially due to livestock production. They are caused mainly by excessive application of mineral fertilisers in crop farming. On the other hand, excrements from intensive livestock production are often not, or only partially, used for fertilising—for the most part they are disposed of directly into lakes and rivers, causing acute environmental pollution. Therefore, this is where the authors locate the most urgent need for action. At the same time, the use of farmyard manure as fertiliser can help restore the traditional balance between livestock and plant production. However, a problem is that industrial livestock production systems lack acreage for crop production. Crop production operations are often small and independent and would need to be persuaded to apply manure from livestock production. Finally, in many regions nutrient application in crop farming generally needs to be reduced. The question of how the livestock revolution can be harmonised with a sustainable use of natural resources will further remain a subject of research. The Swiss Centre for International Agriculture (ZIL) of the Swiss Federal Institute of Technology Zurich will concentrate its research programme on “livestock systems”, with the aim of improving livestock production systems in order to contribute to food security and poverty alleviation as well as to ecological sustainability. Climate change means more than just a global temperature rise of around 0.5 °C. It has a direct impact on natural resources, which are often the only means of existence especially for the poorest population groups. Climate change adaptation strategies must acknowledge this fact, and focus on improved and sustainable natural resource use in order to enhance the resilience of ecosystems and reduce their vulnerability to risks and dangers. In its report, the international “Task Force on Climate Change, Vulnerable Communities and Adaptation” underlines the fact that, along with international policies and global discussions on climate change, a bottom-up approach focusing on action and adaptation capacities of those directly affected, is urgently needed. Experts from four different research areas (climate change, risk reduction, environmental management, and poverty alleviation) have collaborated towards the publication of this report, which will be followed by policy briefs further developing the suggested strategy. Source: Livelihoods and Climate Change – Combining disaster risk reduction, natural resource management and climate change adaptation in a new approach to the reduction of vulnerability and poverty. IISD, IUCN, SEI. 2003, 24p. Helvetas’ recently published “Position Paper on Biotechnology and Genetic Engineering in Agriculture“ is an important contribution of one of the large Swiss non-governmental organisations in support of better recognition of the concerns of developing countries in the controversy about benefits and risks of biotechnology and genetic engineering. The authors of the paper emphasise the necessity for a differentiated assessment of the numerous existing biotechnological applications in food production and agriculture. While they clearly reject generation of transgenic plants and animals, they approve of the use of genetic engineering in marker assisted breeding, where molecular diagnosis helps, for instance, to accelerate the process of breeding drought-tolerant cereals. They also support the use of cell and cell tissue cultures in the production of disease-resistant seed, a technology already applied in ongoing Helvetas projects. In contrast, any biotechnological processes that restrict the natural reproduction capacity of living beings are clearly rejected. Just as clearly, Helvetas condemns the patenting of living beings and the theft of genetic resources (biopiracy). The decision on whether or not a certain technology is to be applied, is left to the partners, while Helvetas supports their decision with an assessment grid included in the position paper. Even if it cannot predetermine decisions, this tool for assessing biotechnologies in the context of development projects and programmes is useful to all actors in development cooperation that are confronted with the issue of biotechnology in agriculture. Eight years after entry into force of the World Trade Organisation’s Agreement on Agriculture, the Swiss Coalition of Development Organisations has reconsidered its previous demand that agricultural markets in the North open to products from the South. Developing countries show a growing tendency to produce more and more goods they do not consume themselves, while consuming more and more products they do not produce themselves. In view of this tendency’s negative consequences, the Swiss Development Organisations have differentiated their position and formulated four demands: 1. Rural development and the development of a sound domestic market in developing countries must be promoted, 2. developing countries must have the possibility of protecting their agricultural markets with customs duties, 3. surplus production and export subsidies in the North must be eliminated, 4. the world market must be regulated in a socially acceptable manner, facilitating the achievement of fair investment and competition regulations, improved market access for products from the South, and stable raw material prices at an income-securing level. Successful implementation of these objectives is only possible if the international agricultural market community rethinks its positions. Global food security must be acknowledged as an important goal, and the needs of developing countries must be taken into consideration in special regulations. However, these objectives will hardly be easy to achieve, given the existing distribution of power within the WTO. Among a host of interesting issues, the present report deals with the highly topical relationship between forests and the fight against poverty. It summarises relevant problems precisely and in concise terms, identifying and explaining opportunities and difficulties, as well as the preconditions necessary to improve forest potential. Alongside eight other requirements, such as decentralisation, the reform of forest ownership, and the fight against corruption, the report also cites deregulation and market liberalisation, two currently very controversial issues. Agroforestry systems, tree plantations or trees growing freely on agricultural land may ease poverty and, at the same time, contribute to forest conservation. However, these measures are not sufficient: business must take root and help contribute to the fight against the depletion of forests. The authors examine the opportunities that deregulation may bring to the poor, while insisting on the necessity to establish or uphold mechanisms to control increasingly liberalised markets. The study is completed by a valuable list of relevant literature. To conclude, we can only express the hope that this report will inspire and influence decision-makers. Source: State of the World’s Forest 2003, FAO, 121 p.
For the first time, the UN World Water Development Report (WWDR), published on the occasion of the 3rd World Water Forum in Kyoto, offers decision-relevant scientific information and analyses on the current state of the world’s freshwater resources. The complexity and difficulty of this task is reflected in the fact that 23 different UN agencies and convention secretariats were involved in producing the WWDR. Dates and facts, world maps, diagrams and case studies are designed to help administrative, political, social and technical decision-makers to promote integrated administration of freshwater resources. New data and approaches are arranged according to 11 challenges concerning the security of life and well-being as well as management issues. Updates are planned to follow every three years. Data quality requires critical questioning, due, among others, to varying conditions and to the conflicts related to water data in many countries. Nonetheless, the report represents an important inventory. The water question is covered comprehensively, and all important information is compiled in one single document. At a conference organised by the Swiss Agency for Development and Cooperation (SDC) on 20 March 2003 in Berne, experts from the International Institute for Environment and Development (IIED), SDC and six Swiss NGOs discussed market studies designed to benefit the poor. The meeting revolved around three case studies presented by IIED. The first discussed the situation in Mozambique resulting from the liberalisation of the world cashew market after 1990, which has so far failed to bring the expected rise in revenue for small-scale producers. Instead, they are forced to deal with greater competition, consider all players and search for local markets, while all these efforts may fail to bring the expected positive results. The second study examined environmental services in catchment areas, which are currently facing the difficult task of raising urgently needed funding in time to avert serious problems for the valleys concerned. Finally, the ongoing debate on “corporate social responsibility (CSR) and pro-poor markets” ties in with the idea that: “The poverty agenda, as it is conventionally articulated, has very little influence on the business community... The notion of creating sustainable livelihoods, by contrast, is music to managers’ ears.” Caught between the belief in such markets’ legitimacy and reluctance towards them, the lively debate that followed was proof of the great interest in this question. Future results will certainly depend on the thought and attention given to the formulation and implementation of supportive approaches. Source : “Pro-poor markets: a background paper by IIED’s Sustainable Markets Group”, SDC-IIED Workshop, Berne, 20 March 2003, 29 p.
With the worldwide loss of agricultural land on the increase, options and technologies to recultivate wasteland are needed more than ever. Promising results have been achieved in the region of Nanjing, China, proving that vetiver grass can be successfully used as a pioneer plant in the revegetation process. Particularly on hilly fallow land the strong roots of this fast-growing grass offer protection against erosion and landslides. Until today, dolomite mining near the city of Nanjing, China, has left behind a waste area of over 200 ha. While attempts to revegetate the area with various trees have been largely unsuccessful up to now, the use of vetiver grass (vetiveria zizanioides) has produced convincing results. Experiments carried through by the Nanjing Horticulture Bureau have shown that substrate composition has little influence on the growth of vetiver grass: it grew without the addition of humus on all major soil components of the mine tails (carbonised shale, dolomite slag, and Xiashu loess). Even though vetiver is heliophilous, it showed good growth under young trees. March and April were found to be the most appropriate time for planting due to sufficient rainfall, weak sunlight, and low evaporation rates among the young plants. The water discussion offers a chance to successfully incorporate gender concerns into international committees, national legislations, and programme and project planning. However, this requires communication skills, convincing argumentation, and a profound knowledge of both the water and the gender discussions. With its “Advocacy Manual for Gender and Water Ambassadors”, the Gender and Water Alliance, an international network of international organisations, offers a practical and well-structured set of teaching material for training men and women in gender and water advocacy. The manual consists of four parts: 1) “What is gender mainstreaming and why is it important in the water sector?”, 2) “Advocacy guidelines and tools”, 3) “Training tools”, 4) “Case studies”. The tools presented in parts 2 and 3 are universal and can also be used for training “gender ambassadors” in areas other than water, e.g. in sustainable land use. There have been many attempts at protecting biodiversity in integrated conservation and development projects. Failures in this strategy have led to returning demands for strict legislative measures. However, biodiversity conservation is based on social and political processes and, thus, needs to be socially just. The goal must therefore be to reconcile pro-people and pro-nature approaches. This is a challenging task, calling for time-consuming negotiations between all parties concerned, such as various user groups and local and national administrations. Many questions need to be answered: Who are the beneficiaries, nature or man? Who is responsible? Who are the decision-makers? How can joint learning help improve conservation? What external constraints influence the process? This scientific article does not offer any simple blueprint solution. Nonetheless, a number of recommendations stimulates further reflection on the issue. The article makes good reading for a quiet moment. The sustainability concept, confirmed at last year’s World Summit in Johannesburg (“Rio+10”), calls for a change of paradigm in science. The challenge is to further open up to collaboration with actors from research institutions in the South, from policy, economy and civil society—“partnership” and “transdisciplinarity” are words often heard in this context. This change of paradigm is to be discussed at a conference organised jointly by the Swiss Forum for International Agricultural Research (SFIAR) and the Swiss Centre for International Agriculture (ZIL) of the Swiss Federal Institute of Technology Zurich. Two international experts will present their views on the subject, followed by workshop discussions on experiences made in project implementation.